45 Adapters KAB has colored plastic domes and Crosley cast aluminum 45 adapters Click here. 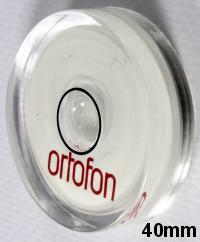 Ortofon's superb large bubble level can be used to set the level of any flat surface. Pfanstiehl SCK Stylus Cleaner Dense circular brush of tightly packed nylon bristles, like Discwasher design on a plastic handle. Includes 2 Oz, isopropyl alcohol fluid. You get more fluid with this kit than any we have seen on the market today. Soft Stylus Brush Give dust blobs the brush off with this very soft stylus brush. Ideal for between play dust removal. SPINDLE OIL High performance spindle oil. Original Technics SFW0 010 spindle oil It is an aircraft specialty Anderol 465 synthetic oil specifically formulated for impregnating sintered metal bearings and parts. 6cc vial. Great for all turntables. TONEARMS Numark Short Straight tonearms for TT-200 , TT-500, and TTX. For Performance Scratching. WIRES KAB carries headshells by Numark, Ortofon and Technics. 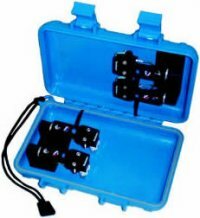 Hard impact resistant watertite plastic case safely houses four(4) cartridges mounted on standard headshells. Our new Poly-Metal mat is 1/8" thick, 11.5625" diameter and over 8 oz in weight. PLATTER 15.5" Laser cut aluminum support disc . Improves all transcription players with 12" platters. HUNT EDA BRUSH Twin Rows of Carbon Fiber. Use Before Playing To Lift Lint And Drain Static. R.C.B. Soft velvet brush. Great for pre play dust removal. Carbon Fibre Brush Basic Carbon Fibre Brush. Twin Rows with sweeping handle. You've seen this before. It is just like Pickering CFB80 and the like. Velvet precleaning brush. Neat built-in resevoir humidifies brush fibres to dissipate static charge. Includes soft bristle stylus brush too. All turntables should have calibrated counterweights. But if yours doesn't, here is the best way to measure tracking force. Great Low Price Too. Digital electronic scale reads up to 5.0 grams. Self calibrating with test weight included. Battery included. KAB Replacement Platter Spindle KAB is pleased to have available a newly machined platter spindle for all Vestax BDT2000/2500 manufactured before December 2005. The fit between the platter and the spindle has always had some play in it and this can lead to a less then level playing surface. Our new spindle is custom machined and polished from 303 stainless steel and fits the platter perfectly. Easily replaced. Looking For the Technics Page? Click Here. Looking For the Interconnect Page? Click Here. Precision Phenolic W/Bubble Level. Holds Records Snug For Better Sonics. Low Profile. Since 1956, Caig leads the field in safe, effective electrical contact maintenance. KAB Great Sound Escorts are passive powerless devices that improve, test and enhance your sound system. KAB Great Sound Escorts are active devices that improve and enhance your sound system. Does a phonostage require burn in? Burn in can make subtle improvements in the component function that, depending on the quality of your system and your own personal priorities, could translate into big improvements in performance. With rare exception, most audio designs have components, especially capacitors, that never see a stabilizing bias voltage. These components benefit most from burn-in. Burn in is the application of asymmetrical signals which have a tendency to "charge" these components and, for a time, stabilize their performance. The process should be repeated every 3-6 months. Do Record Clamps Really Help? Yes. This is simple to understand. When the stylus is sitting in the record groove, the record behaves like a microphone picking up sound in the room and vibration from the turntable body and support system. Clamping the record firmly, reduces the record's ability to freely vibrate allowing the needle to "read" the groove more accurately. The improvement is a clearer soundstage and better bass performance. How Can Different Interconnects Improve The Sound? Part if this is purely better materials and construction. machined connectors and split center pins, ensure a more reliable longer lasting connection than more common designs. Gold plating is more reliable and less resistant to oxidation than other finishes. The other more subtle part is wire stranding techniques. Isolating strands and using varying width conductors is known to make subtle improvements and, depending upon your personal priorities may translate into big improvements in your musical enjoyment. Do Sorbothane Footers Really Work? The best example I can give here is my own experience with our Technics 1200 turntable. With the stock feet and with the needle on the record, if you tap the turntable on top, very little sound is heard through the speaker, but if you tap it on the side... A bump.. bump.. bump is heard. When I replace the stock feet with the SD50 Sorbothane footers, the side tap is just as suppressed as the top tap is. I know that tapping is not quite the same as vibration from sound, but the result gives me a little more peace of mind. Are Contact Enhancers Worth All The Effort? Electrical contacts degrade very slowly over time. Most audiophiles hear big improvements when they use a contact enhancement product for the first time. It is best to apply contact enhancers when you first connect a new piece of equipment. In this way, you will slow the rate of degradation, and minimize the hassle. Audio accessories are the little tweaks and things that make the audio hobby more interesting. Most items are self explanatory. Some may seem unusual. Test Record: Used for evaluating the phono performance and overall playback system. Interconnect: These are the wires that connect the various pieces of audio and video equipment. Burn In: The application of special test signals to aid in stabilizing electronic components; ultimately enhancing fidelity. 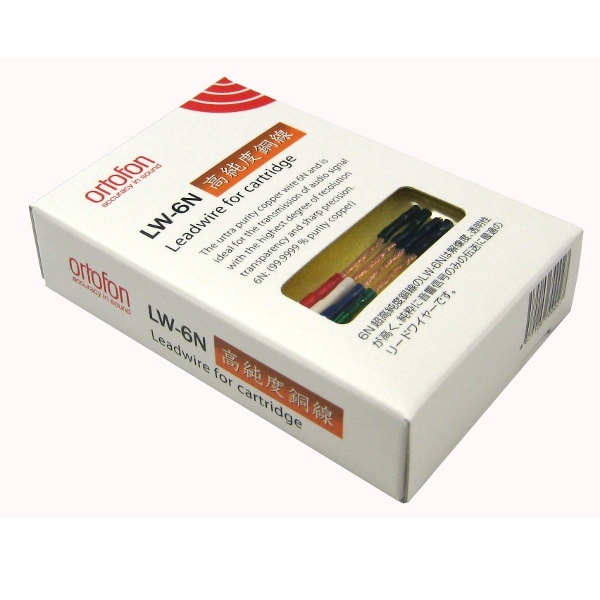 1 Quantity, and Buy Now control your ordering activity. Select the Quantity and left click the Buy Now button to place the item in your cart. Left click the Show Cart button to see what you have purchased so far.